Spreading over an area of 58,000 Kanal, LDA City is located between Ferozpur Road, Defence Road, Kana Kacha Road and Lahore-Karachi Railway Line with its entrance along the Butcher Khana distributary, Just 1.5 KM from Terminal Station of Metro Bus Service. Construction of New 2.1 KM long and 180 feet wide acess road from Gajju Matta to LDA City has already been completed at the cost of 1.13 billion. The scheme also has been provided a link from Kacha Flyover, the first ever fly over constructed in Punjab on Public-Private partnership basis, on Kacha Railway crossing along with Defence Road. 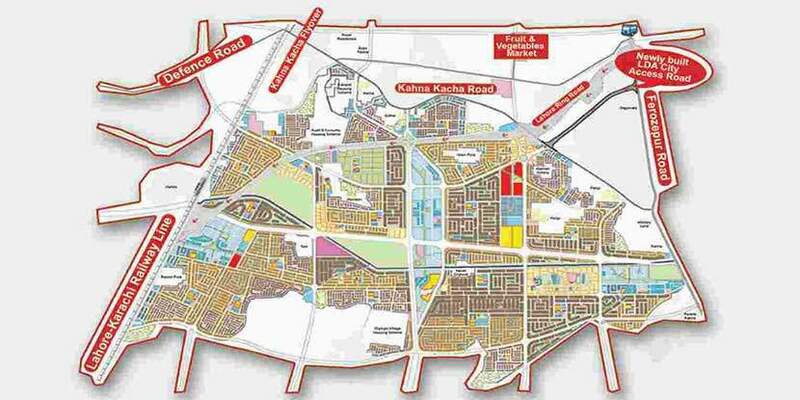 Town Planning of LDA City has been completed, beside housing units of different categories, high rise buildings, large public parks, theme park, golf course, diplomatic enclave, world class Central Business District (CBD), educational and health cities (universities & hospitals) and modern commercial centers have been planned, aiming to give residents at affordable cost. LDA City will be developed into two phases comprising of 9 Sectors. LDA is going to commence the development work in the scheme.